Whale watching can be a thrilling experience. In our excitement we sometimes forget that our presence can affect the whales. Whales are mammals and just like us, they need space to find food, to socialize and to rest. If we get too close, approach too fast, or make too much noise, we may be disrupting these activities, causing the animals unnecessary stress. Under the Fisheries (Protected Species) Order 1978 it is illegal to harm any marine mammal. 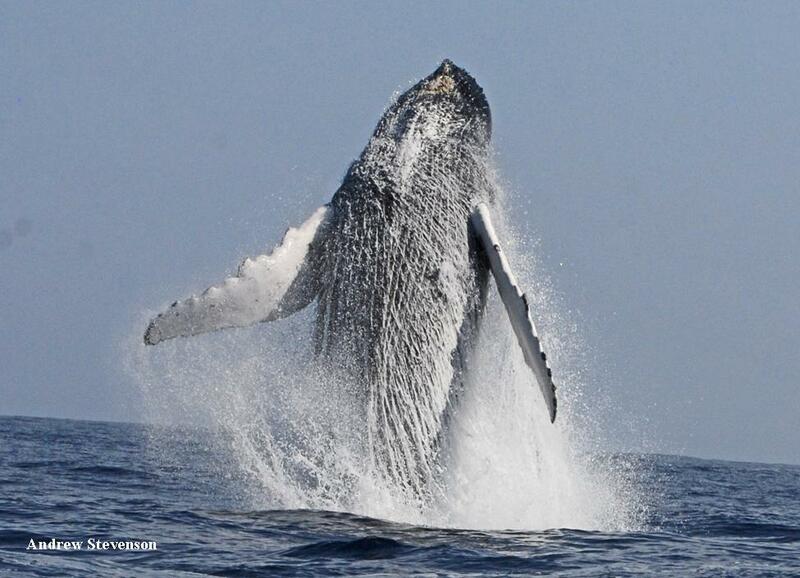 Under the Protected Species Act 2003 it is an offense to disturb or harass humpback and sperm whales. If a whale or dolphin is disturbed it may attempt to leave the area (quickly or slowly), change direction or speed of swimming, change its diving and breathing patterns (i.e. it may spend more time diving compared to time spent at the surface) and there may be an interruption in feeding or nursing, etc. These guidelines are designed to help you enjoy your whale (or dolphin) encounter and to reduce the risk of disturbance. Please help to protect the whales and dolphins by following the guidelines and setting an example for other boaters. If you see a whale, SLOW DOWN and PROCEED WITH CAUTION. Where possible, post a dedicated lookout in addition to the skipper. DO NOT approach closer than 100 m to any whale or 50 m to any dolphin. This area is the CAUTION ZONE. When within the caution zone of whales, move at a constant, slow, ‘no-wake’, speed. Maximum speed not to exceed 7 knots. Avoid sudden or repeated changes in direction or speed when within the caution zone. This will decrease noise and risk of collisions. Avoid approaching whales from directly in front or behind. Always approach and depart whales from the side, moving in a direction parallel to the direction of the whale. If your vessel is unexpectedly within 100m of a whale, take you vessel out of gear and allow the whale to pass. Allowing a vessel to drift within the approach limits specified for whales due to wind, currents or forward momentum constitutes an approach and should not occur. If the whales show behaviours indicating disturbance, immediately withdraw from the caution zone at a constant ‘no wake’ speed. Whales should not be pursued. If a whale moves away, DO NOT chase it. When stopping to watch whales, place your gear selector in neutral, and allow the motor to idle without turning it off; or allow the motor to idle for a minute or two before turning off. This prevents abrupt changes in noise which can startle the animals. Avoid excess engine use, gear changes, manoeuvring or backing up to the whales. These produce sudden, large changes in underwater noise levels which may startle the whales and drive them away. To prevent crowding the whales, avoid having more than three boats within the caution zone at one time. If more than one vessel is present, vessels should position themselves adjacent to each other to ensure the whales have large open avenues to leave the area. Vessel operators, where possible, should coordinate their movements around whales by radio contact. Do not crowd other whale watching boats. When encountering other whale watchers, wait your turn at a distance, and then approach cautiously after they have left the area. It is recommended that you limit your viewing time to a maximum of 30 minutes. This will minimise the cumulative impact of many vessels and give consideration to other viewers. Whales will sometimes approach the vessel, more closely than the specified approach distance, of their own accord. If this occurs, place the engines in neutral and let the animal(s) come to you; or slow down and continue on course, avoiding potential collisions; or steer a straight course away from them. Remain quiet. Avoid making loud or sudden noises near whales. Avoid sudden movements that might startle it. Do not touch the animal. You can place yourself and the animal at risk. You are advised NOT to swim with any whale due to the size and unpredictability of these animals. Move off at a slow ‘no wake’ speed to the outer limit of the caution zone for the closest animal before gradually increasing speed. Avoid engaging propellers within the minimum approach distance, but if necessary to do so, use extreme care. The whale watching guidelines also apply for dolphins except where stated. A vessel should not be brought within the caution zone for dolphins faster than a ‘no wake’ speed as this may encourage dolphins to bow ride. Should dolphins choose to ride the bow wave of your vessel, REDUCE speed gradually and avoid sudden course changes. Adults with white or pale gray head, back brownish, becoming lighter on the underside.